The Australian and New Zealand electrical industry has until recently relied on ENA NENS 09-2006 for guidelines on the selection, use and maintenance of Personal Protective Equipment. Those guidelines specified that the minimum protective clothing for work where electrical hazards exist shall have properties not inferior to 185gsm cotton drill. AS/NZS 4836:2011 Safe working on or near low-voltage electrical installations and equipment provides a new level of requirements for electrical works. The new standard details significant especially in the area of protective clothing and face shields. The standard requires flame-retardant clothing covering the full body including arms and legs, and a face shield certified as rated at 10 cal/cm2 protection. 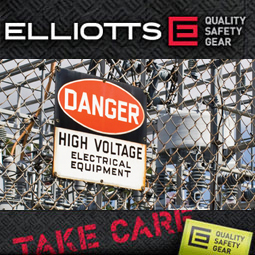 "At Elliotts, we have been recommending that FR clothing should be standard for any employee working on or near energized electrical systems for many years. We have developed a full range of FR workwear and switching clothing specially designed to meet Australian conditions. The Reference Centre on our website has information to help people understand FR Workwear, switching clothing and the standards and materials that are used in them." Said Anthony Elliott, Managing Director. The table below summarised the changes between the new standard and ENE NENS 09-2006 guidelines. Face shield certified as rated at 10 cal/cm2 protection. Arc flash suit and hood rated at a minimum of 40 cal/cm2 protection. Appropriate footwear shall be selected, used and maintained in accordance with AS/NZS 2210.1:1994 for all work where there is a potential for exposure to electrical hazards. Gloves complying with AS 2225 or an equivalent standard and insulated to the highest potential voltage expected for the work being undertaken, air tested each time prior to use. Gloves complying with AS/NZS 2161.4 e.g. gloves made from leather or other non-melting heat resistant material. Flame-retardant clothing covering the full body (including arms and legs) and not made from conductive material or containing metal threads. Have properties not inferior to 185gsm 100% cotton drill. Industrial fall-arrest systems and devices complying with AS/NZS 1891.4 and that have been checked and inspected each time before use with particular attention being paid to buckles, rings, hooks, clips and webbing. Respiratory protection complying with AS/NZS 1715 and AS/NZS 1716. The information provided in the above tables are summarised from ENA NENS 09-2006 and AS/NZS 4836:2011. These documents should be referred to for full details and additional ESSA codes and guidelines. See SAI Global Infostore for more information.